The editor currently supports three layers of graphics. a base for the ground tiles, a middle layer for trees, buildings and other objects that the player character may be able to walk behind, and a top level for objects which will always be in front of the character, such as light hangings in indoor scenes. 2. Get some tiles or make your own. 3. Drag n drop tile images onto the editor. Code and images may be used, distributed, and modified freely for any purpose, commercial or otherwise, without limitation. No warranty is made for the safety of this code or its fitness for any purpose. The source code is included in the JAR file. If you have winrar or winzip, you can open the jar file in one of those programs to extract it. There are also the tiles and some sample maps in there too. If you used this program or source code and found it useful, a credit or link to this page in your product is appreciated but entirely optional. Adjust hue, saturation, and RGB levels to give seasonal, or night time looks to the scene. Maps save as simple text files with numbers - easy to parse. 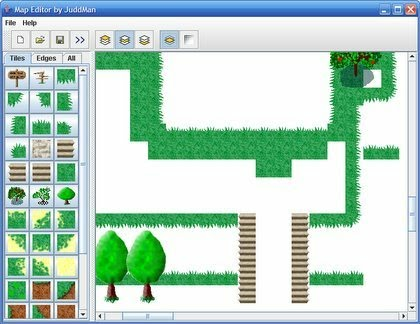 Easy to make tile sets - Just drop the image files you want onto the tileset pane. Tiles in folders can be added by dragging the folder containing them onto the tile set. The tileset can be edited. You can now drag new images onto the tile chooser panel to create new tiles. Older versions of the tileset and map files are not compatible with this version or newer versions of the editor. Drag the map around using the right mouse button. Although i have not seen any problems with continuing to use it after it doing that, as always, there are no guarantees. The worst that can happen is it stops responding or displays messed up graphics. Small change: The colour adjust dialog is now activated and deactivated using a toolbar button. There is also now a reset button on it. Scenes can now be easily resized and shifted around using the new toolbar buttons along the top of the screen. But be careful - if you shift some tiles off an edge, they'll be gone. It is always best to work with a larger map than you need. Scenes can be colourised - you can adjust scalars for red, green, and blue channels, as well as hue and saturation. This allows for some nice effects such as seasons, day and night, and completely unusual colour styles, without making a whole new tile set for each effect. The colour effect is controlled using a new dialog.